Some of this might seem very similar - certain parts are copied/pasted from my 'FD' How-To on the same subject. N.B. As I don't have a GD to take photos of - any in car photos are from others. The intention of this 'How-To' is to cover/bring together the common aspects of removing, replacing or swapping the GD body OEM headunit for another or an after market unit. Sections of this information is either buried as sub-posts to related topics (I hope the authors won't mind me 'stealing' instructions) or found by googling. It won't really cover handling specific aftermarket units and/or 'extra' functions of OEM regional head-units. The pin-outs referenced are from an OEM headunits fitted in AU (they are the pinouts I have available) - they are GD-01 & GD-02 the difference being (except different labels for the same function ) the GD-02 does reverse camera display and five (previously i.e. on GD-01) 'N/C' pins are used for that. The pin-functions, from the GD-01 (at least) should apply in *most* instances being generic/mandatory functions... but different OEM pinouts, plus extra connectors, might apply in your region i.e. there is a chance pins could have different functions. But more likely the pins for functions not used in your region (if any) will be 'N/C' for you, with 'extra functions' on pins shown as 'N/C' or in extra connectors (if present). An example is: In some regions there are 'Navi' headunits - with an extra connector for that plus an extra aerial socket (for either it or digital/satellite radio). * Some OEM headunit models have extra connectors, or sockets, for extra functionality - e.g. Satellite or Digital radio (US: 'XM' service), Navigation units, etc. * Buttons may have different functions depending on region and/or OEM model. * There are 'global' models (with regional variants - such as mentioned above... 'XM' in the USA; and known regional OEM models such as 'GD-01' and 'GD-02' units; plus some OEM GPS navigation units - models unknown). * You probably will not need an antenna adapter - Hyundai appears to have reverted to using the 'traditional' round socket. As the faceplate of the headunit *is* the fascia for that section of it (on all GD OEM headunits and images I have seen) - it actually occurs when you remove the headunit... but first you need to access the mounting screws which are hidden under some trim, and you may need to unclip the fascia (Climate Control aka A/C) section below it. However see Fascia & 2DIN Aftermarket units as there appear to be two different replacement options. Replacing the trim should be a simple matter, having checked and repositioned the trim clips (if needed), of basically repeating in reverse (in line with starting at the bottom for removing - starting at the top and working down will probably be easier for replacing, esp. as you need to line up the vents). Both the second and third videos in Fascia Removal/Refitting show removal/loosening of the A/C controls (second video shows more detail of this aspect), with the third also showing radio removal (but A/C controls less clearly). The fascia section of the A/C controls clips into two plastic loops on the bottom of the radio - as well as clipping into two loops below the A/C control section (likely where 12V supply sockets are mounted). To remove the radio will require unmounting, but not necessarily removing the A/C controls (i.e. we shouldn't need to unplug any wires and/or hoses on it). To unmount the A/C controls (for OEM headunit can be removed) we need to remove the four philips head screws (two per side - should be above and below a trim clip mount) mounting it to dash-frame, then get the A/C faceplate unclipped from above (two loops bottom of OEM headunit - one either side) and below (two loops top of next section) sections. The second video shows this, however we *probably* (someone with experience might advise otherwise) shouldn't need to unplug the controls nor dis-assemble them (unless you really want to) as it shows - relevant section being here till about 1:18m... with the bottom loops being focused on from around 1:00m. If simply replacing like-for-like (bad for good) or swapping OEM models - assuming the replacement came with mounting brackets or the original brackets fit the replacement - then refitting should just (basically) be the reverse of the Removal steps... just remember a) try to re-use the existing threads when remounting the radio and A/C controls; b) don't over tighten (but don't let them be loose either). * The other is one piece and appears to replace both the headunit and climate control, etc. fascia sections with one piece as seen here example of a vendor is here. Could this be to ensure consistent 'colour'/'gloss'? 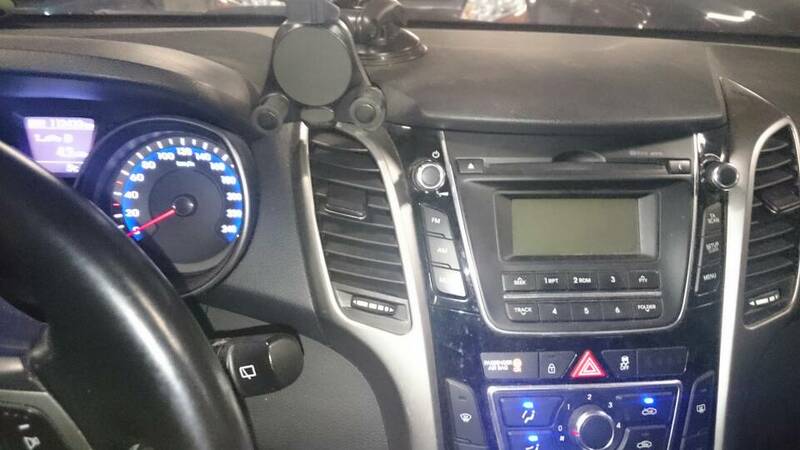 It would seem unlikely some i30 GD models would have one-piece fascias when it appears all GD OEM headunits being sold on ebay (from US, UK, AU, etc.) have faceplates that make up just their section of fascia. This process of fitting (safe to assume A/C controls would have to be detached from their original fascia as well) this type of replacement fascia won't be covered here (maybe someone will write a separate post in this topic about it). * Did your replacement fascia come with extra bits - such as this one from this vendor - which appear to be 2DIN compatible mounting brackets designed to fit like the OEM mounting brackets? * If not do the OEM brackets fit? And/or did the replacement fascia come with something to make them fit? * Will you need a 2DIN generic adapter enclosure (esp. if mounting 1DIN device instead) - and how to mount that to dash frame? * Will the aftermarket headunit require a bezel between it and the replacement fascia (if it's face is a little smaller than the hole in the fascia)? All the OEM headunits for the GD body appear, at a minimum, to use two white connectors (plus a round analogue radio antenna plug) - the two white connectors one is 18-pin (8 bigger, 10 smaller) and the other is 24-pin (4 bigger, 20 smaller)... both carry 'essential' (speaker connections, power) and non-essential/optional/manufacturer defined (USB, AUX, Remote, camera input, etc.) functions. It is unknown if these connectors are a std. - or what they are called. 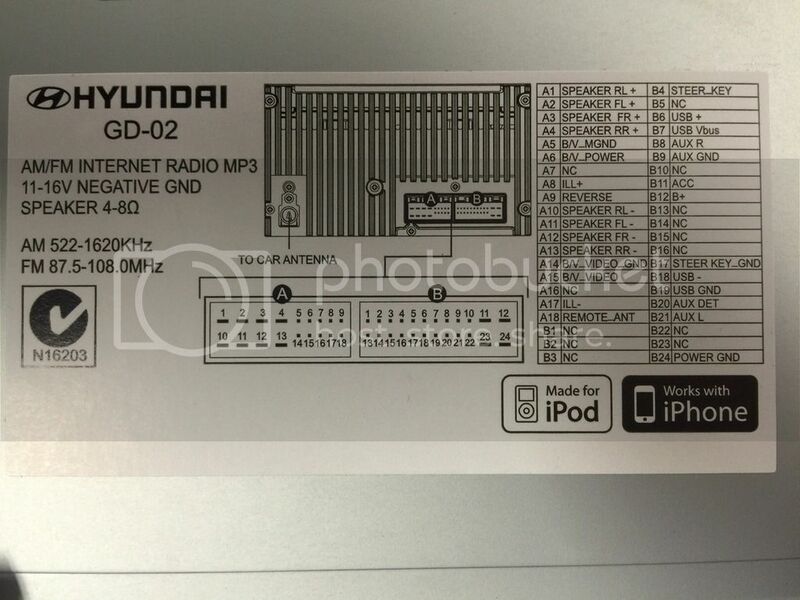 The pinouts that will be shown are from GD-01 and GD-02 (Australian OEM) units... the difference between them being (except different labels for the same function on same pin ) the GD-02 does reverse camera display and five (previously i.e. on GD-01) 'N/C' pins are used for that. 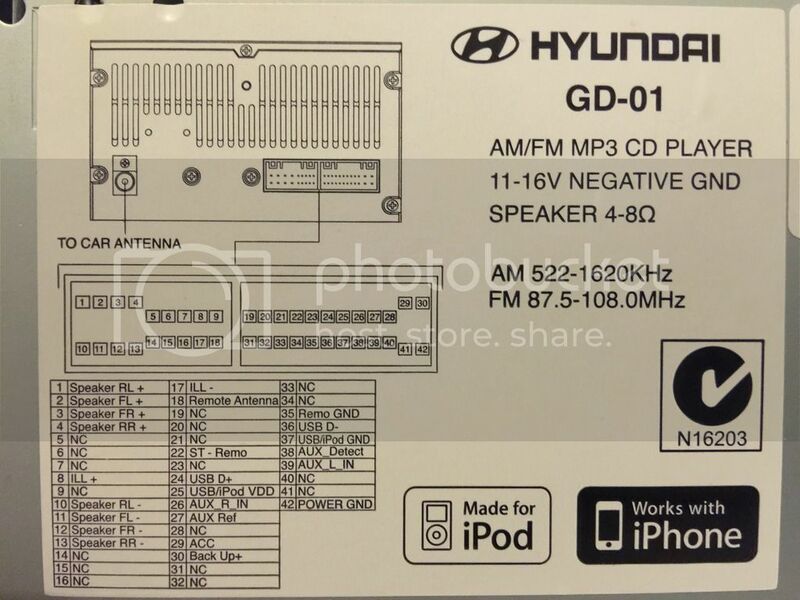 Therefore some 'option' functions may, or may not, be present on your OEM headunit; or yours might have others... for example other OEM headunit may have 'MIC' (for handsfree) - the GD-01 & GD-02 don't because they have *inbuilt* mics. Feel free to point out different function(s) and which pin(s) it/they are on for your OEM headunits - if you know them. The GD-01 pinout will probably apply in most cases - being most of it's functions are pretty generic (even optional ones). At time of writing - there doesn't appear to be well-known "Gotcha"s regarding the wiring. You may also want a wiring loom 'adapter' - which can cover a couple of different situations... such as not needing to remove/reinsert (which could be hard) contacts in the vehicle connector (or cut and splice the wires to achieve the same) to match the headunit if it uses the same connectors as the vehicle; or not needing to cut the plugs from the vehicle wiring (if it doesn't use the connectors). If doing this you will probably want (unless your lucky enough to find a suitable pre-wired one) an adapter loom that connects to the vehicle plugs on one end - so you can connect the wires from it to the wires from whatever wiring loom the headunit is supplied with. Just be aware some adapter looms don't come with all connectors present. On some OEM headunits there maybe extra connectors for extra functions, which may, or may not, be suitable for use by the Aftermarket headunit. Note: In the case of 'MIC' mentioned above - the pins will likely (BIG GUESS - can someone confirm) be labelled something like 'MIC (+) B/T' and 'MIC (-) B/T' and possibly could be pins B10 and B22 (per pinout numbering from GD-02) respectively. Some aftermarket headunits support inbuilt steering controls - usually requiring the user to 'teach'/calibrate/program it for the buttons and what function to do. How they work is relatively simple - there are two wires... the buttons on the steering wheel connect different amounts of resistance between them when pressed. By determining the resistance connected (usually by voltage drop and a constant current) - the headunit knows which button is pressed. The values of the resistances are unknown at this time. Was/Am attempting to use the Subject to indicate the specific content of the each of messages/'replys' to the overall topic. I used the same format previously in my FD how to - it seemed to work. Sorry if it caused confusion. My only intention is to make it easy to ID what each message pertains to as part of How To. Have anybody a solve/idea how put the unit sleep ? Okay... 'wild shot in the dark' here. Have you checked for B+ (memory) and IGN (switched 12v - aka ACC) pins being swapped (relative to an OEM unit/vehicle wiring) AND mislabeled (if applicable) on the headunit. If you haven't you might wish to do so. As I suspect you already had to cut the "B+" wire for your tmp. fix - I imagine the easiest way to check is to cut the "IGN" wire so you can swap which vehicle wire supplies which pin. It occurs to me if the headunit actually draws most of it's power via IGN (i.e. lets assume 'B+ memory', which ever one it is in the circuit, is only used for that) AND the pins are swapped (and mislabeled) - then the vehicle B+ (unswitched from battery) is powering the actual (i.e. as far as the electronics of the unit are concerned) IGN line... so the unit thinks the car is on always and so stays on. If the label (if applicable) then IDs them per the OEM wiring (even though they aren't at the electronics/circuit level) - then when you are connecting the "B+ (memory)" line to 'external power 12v' (as per your temporary fix)... you are really connecting IGN line (per headunit electronics) to a switched (i.e. IGN) power source - so the unit happily obeys. I put this forward as I am assuming they didn't make the main electronics of the headunit specifically for the i30 only (I could be wrong though), even though it came with i30 faceplate and buttons on the front (and/or i30 tailored firmware - doing firmware variants is easier, and cheaper, than electronic variants). And when Hyundai was using the ISO 10487 a common issue (with aftermarket headunit fitting) was these pins (B+ and IGN) needed to be swapped (there was no std. on actual pin positions) - it wouldn't surprise me if this is still the case. Then all it takes is someone not familiar with the actual meaning of the pin labels to put the wrong label against the pins - e.g. using an OEM label as a reference. ^^^ all that makes perfect sense ibrokeit. I had to perform surgey on an aftermarket stereo a while back as two of the colour coded wires on the unit didn't match the receiving block, meaning the radio kept losing its station settings. I have made a test. Swapped B+(yellow) ACC(red) wires in the harness, the unit not even turn on. ?? Put reverse gear, not open reverse camera view, stays off.. ? I measured original plug, B+ 12,65 V , ACC vary between 0-12,65 V ?? Canbus system ? "Fixed" again temporary fix (cig. lighter 12 V) it works .. Only have to set after put on, o`clock and calendar. Keeps radio settings, phone books.. The unit came with Canbus decode, the seller was surprised;their unit is without. After I sent a photo they believe... but the seller told, no need. Later asked is the car low or high configuration ??. High needs Canbus module ? I have tried earlier with/without Canbus.. no help.. The seller have "promised", OS update (Android), new wires.. ?? Damn - oh well it was a good idea while it lasted. Sorry - I don't have any further ideas at the moment. And unfortunately I only have an 2010 FD to pull to 'pieces'. The only thing I will note - is regards to your varying ACC... that, to me, is odd but no idea why it is being observed (except for the obvious, but probably unlikely to be persistent, bad connection between contact and measurement probe). I do remember that CAN bus systems are supposed to be two-wire (excluding any GND) differential signalling systems (though as I recall there is a fault mode allowing use of one wire) - there by providing detection of physical medium faults and redundancy to what could be a safety-critical, or something that could impair safety, sub-system. CAN was used on certain mobility systems I used to work on. Not sure that CAN signalling would be done over ACC - but I am in no way up with the latest development in regards to automotive CAN. "I measured original plug, B+ 12,65 V , ACC vary between 0-12,65" ... I asked from Importer of Hyundai, technical advisor suppose a reason is ISG system, and maybe it needs a Canbus decoder. In ISG model car a power comes by DC/DC converter. Of course they have no experiences about Aftermarket units. Have anyone mounted for example this kind :(Android-Car-DVD-GPS-for-Hyundai-i30-2013--1GHz-Bluetooth-Radio-RDS-Wifi). Car model i30 GDI 1.6hp ISG Blue Drive. Without a battery drain problem.. ?? I sent the unit back to the seller, and they sent it to service in a factory. Now it is fixed and the seller send it tomorrow to me.. A fault was hardware.. Hope it works well..
Good to hear you have had 'progress' - bit of an inconvenience needing to remove it, etc. but so is it not working properly! Has been good training to remove and install the unit many times, it takes only some minutes.. almost expert..
Today it arrived from China and checked in my "kitchen lab". Looks good, and works properly,sleep current 8 mA. Before warranty repair 650 mA. Now it works well and sits nice. No report came with, what have they done, but it really shut off now..
Good to hear/see. Please keep us in the loop if you have further issues. Do you mind elaborating which after market headunit you have? and where you got it from? But cannot find any feedback other than what is on that web site. I also don't know how good the Nav software actually is? Therefore, my interest in what unit you have, your experience & where you purchased? Will it be for my i30gde (2013)?